There is a very large discrepancy between our estimate and NHC's estimate of strength of hurricane Rick. The National Hurricane Center still has Rick a major hurricane at 115 mph on their last advisory, we now estimate Rick at 85 mph with the strongest winds east of the center. In fact this may be too high. The most recent visible images show the low center becoming exposed. If top sustained winds are 115 mph as the official estimate suggests, we should find gusts in the vicinity of 130 mph. With our estimate gusts could be around 100 mph. We will know for sure soon as a recon is heading to the area and should be on site early this afternoon. Rick has already starting slowing down its forward speed. It will be making a turn to the northeast very late today or early Tuesday. This turn is from a very strong upper disturbance diving into the southwestern U.S.. This new motion will put it in the vicinity of Cabo San Lucas by early Wednesday morning. Surf of 12 feet + can be expected on the Pacific coast near Cabo San Lucas. Under the eyewall, seas up to 30 + feet with some higher waves can be expected. Seas will gradually diminish near the hurricane center today as the hurricane has weakened. 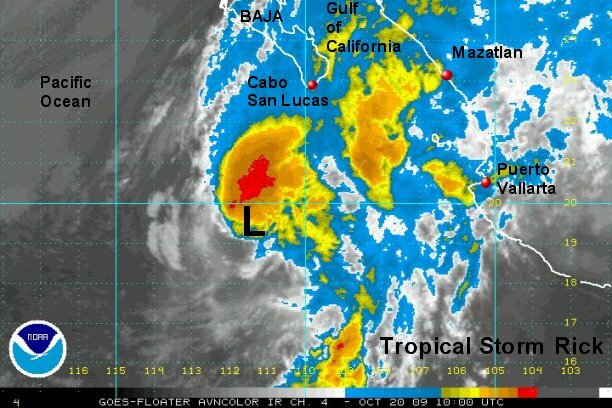 As of 12:00 pm edt / 9:00 am pdt Rick was centered near 17.8° N / 111.3° W or about 360 miles south southwest of Cabo San Lucas, Mexico. Top sustained winds are estimated at 85 mph (NHC 115 mph 11 am edt advisory). Hurricane Rick is slowing down, moving northwest about 8 mph. The recon found a maximum flight level wind of 85 mph. It looks like our forecast was on target. The maximum surface wind was 68 knots or about 78 mph. Rick is barely a minimal hurricane now. We assume that NHC will drastically drop their wind speed on the next advisory. This is excellent news for Cabo since Rick is decreasing quickly. We're simply amazed. NHC held winds at 100 mph. In their discussion they stated that even though the recon only found 68 knot flight level winds it didn't sample some of the deeper convection so were holding at 85 knots or 100 mph. With a 100 mph sustained wind, one should find gusts to 115-120 mph. Nothing like that was close to being found. The 975 mb pressure says it all. That is a pressure representative of a minimal hurricane. Usually were in close agreement with NHC, but not this time. Rick has a sorry looking appearance on the satellite imagery. We believe that NHC still has this system "pumped up" too much. Deep convection is only seen on the eastern side of the circulation as it passes just to the west of Socorro Island. 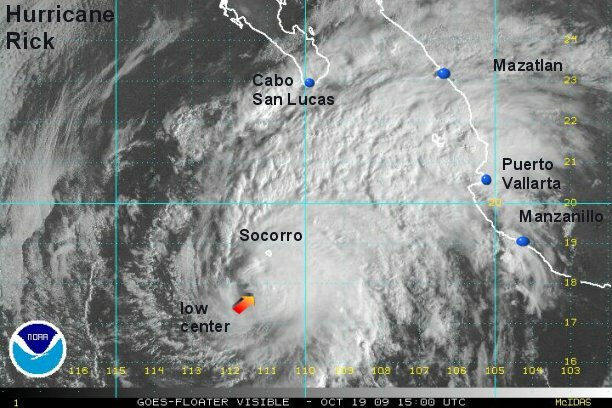 Conditions are looking better for Cabo San Lucas as this weakening trend continues. Surf of 12 feet + can be expected on the Pacific coast near Cabo San Lucas. Under the deep convection to the east of the center of the low, seas up to 25 + feet with some higher waves can be expected. Seas will gradually diminish near the center tonight. As of 9:00 pm edt / 6:00 pm pdt Rick was centered near 18.9° N / 111.7° W or about 295 miles south southwest of Cabo San Lucas, Mexico. Top sustained winds are estimated at 65 mph (NHC 85 mph). Rick is moving north northwest about 7 mph. 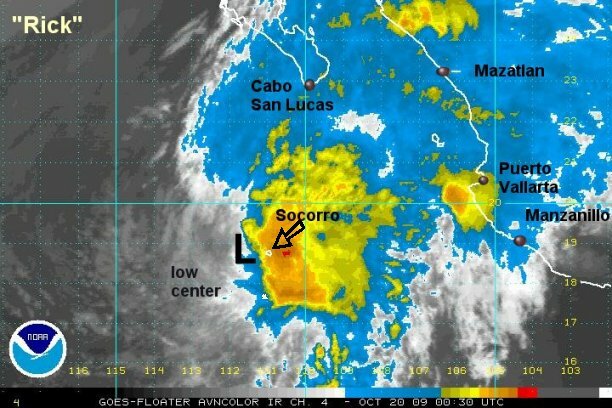 Interests in the southern Baja should continue to follow the progress of Rick closely. It appears that Rick has weakened only a little more overnight. Deep convection remains to the north and east of the low center. This will bring rain to the southern Baja and the western coast of mainland Mexico. Rainfall of several inches is possible as the motion of Rick remains slow. Satellite imagery shows that the surface low and mid level low are disjointed. A mid level spin is noted about 50-75 miles northeast of the surface low this morning. This is simply a sign of a system not well organized. Rick is starting to make its turn to the northeast with mostly a northerly motion at this time. Surf of 12 feet + can be expected on the Pacific coast near Cabo San Lucas and the west central coast of Mexico north of Cabo Corrientes into the eastern side of the southern Gulf of California. Under the deep convection to the east of the center of the low, seas up to 20 + feet with some higher waves can be expected. Seas will continue to gradually diminish near the center today. As of 7:00 am edt / 4:00 am pdt Rick was centered near 19.5° N / 111.4° W or about 250 miles south southwest of Cabo San Lucas, Mexico. Top sustained winds are estimated at 50 mph (NHC 65 mph). Rick is moving north about 6 mph. Interests in the southern Baja and the northwest coast of Mexico north of Cabo Corrientes should continue to follow the progress of Rick. The recon came back in with this report. Maximum surface wind reported was 48 knots or 55 mph. It looks like our 50 mph estimate from a little earlier was good. With a sustained wind of 50 mph, some winds of 55-60 mph should be found. With surface winds of 65 mph some winds of 75 + mph should be found. Flight level max wind was 63 knots or about 72 mph at 10 K feet. Rick looks to move south fo Cabo San Lucas in the next 24 hours. The main threat continues to be heavy rain. NHC is leaving their estimate at 65 mph because a few models weaken the system and a few make it a hurricane before landfall. So, they are taking a forecast of least resistance. We will stick with our 50 mph wind which was close to the observed wind by the recon. Right now little change is noticed in the strength. a complete update on Rick later today. Recon later today found surface winds of 45 mph. We believe that a slight strengthening has occured over the past few hours as deep convection is expanding again. 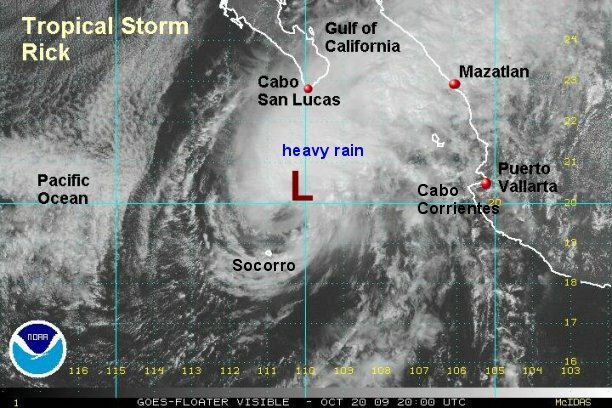 Rick will move south of Cabo San Lucas, so the main threat will be heavy rain where there is potential for a few inches. The greater threat will be on the mainland coast near Mazatlan where heavier rain of several inches may occur. In addition, there is still a chance that Rick will strengthen again before landfall. Surf of 12 feet + can be expected on the Pacific coast near Cabo San Lucas and the west central coast of Mexico north of Cabo Corrientes into the eastern side of the southern Gulf of California. Under the deep convection to the east of the center of the low, seas up to 20 + feet with some higher waves can be expected. Seas will hold steady this evening or possibly build tonight if any additional strengthening occurs. 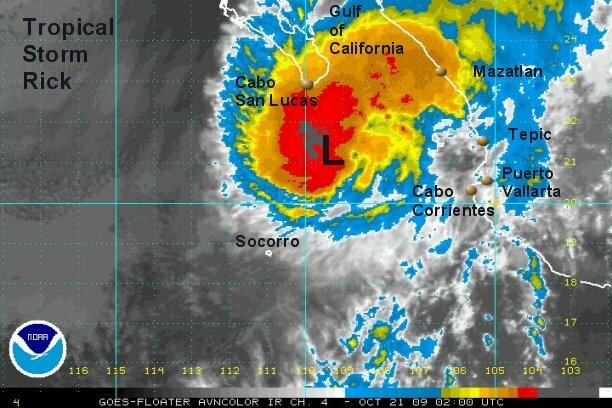 As of 5:00 pm edt / 2:00 pm pdt Rick was centered near 20.4° N / 110.1° W or about 250 miles south southwest of Cabo San Lucas, Mexico. Top sustained winds are estimated at 55 mph (NHC 65 mph). Rick is moving northeast about 9 mph. Deep convection - heavy showers and storms continue to build this evening near the circulation center. Rick may strengthen a little more before landfall Wednesday despite formidable shear. Rainfall of several inches is probable near where the low center makes landfall. Flash flooding and mudslides are a concern. 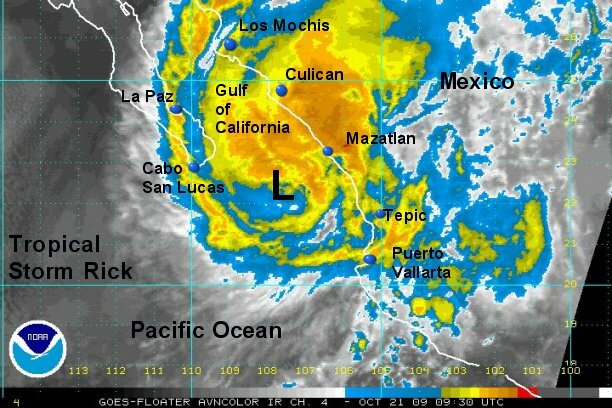 As of 11:00 pm edt / 8:00 pm pdt Rick was centered near 20.9° N / 109.2° W or about 145 miles south southeast of Cabo San Lucas / 240 miles southwest of Mazatlan, Mexico. Top sustained winds are estimated at 60 mph (NHC 65 mph). Rick is moving northeast about 12 mph. Cloud tops have warmed overnight indicating slight weakening as Rick is about to make landfall. Seas will be in the 12-15' range or higher under the deepest convection / strongest winds northwest of Mazatlan. Additional rains of 1-3" or more is possible as Rick moves by over the next few hours. As of 7:00 am edt / 4:00 am pdt Rick was centered near 22.3° N / 107.4° W or about 95 miles southwest of Mazatlan, Mexico. Top sustained winds are estimated at 50 mph (NHC 65 mph). Rick is moving northeast about 12 mph. This will be our last advisory on Rick.